One of the largest IP practices in a general practice firm within the Midwest, we have broad experience and a deep bench in prosecution, litigation, opinions and counseling. Calfee has one of the largest Intellectual Property practices in a general practice firm within the Midwest. The attorneys in our IP group have broad experience and a deep bench in prosecution, litigation, opinions and counseling. 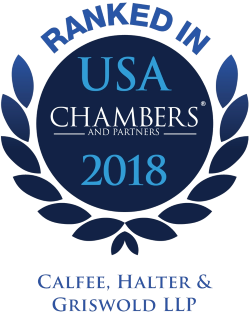 Of the approximately 40 skilled attorneys in Calfee's Intellectual Property practice, more than 30 attorneys are registered to practice before the U.S. Patent and Trademark Office. Calfee’s intellectual property lawyers are integrated within our general corporate firm. Many businesses historically have chosen “boutique” intellectual property firms to handle their trademark and patent portfolios. While the Intellectual Property group at Calfee functions in many ways as if it were a distinct “boutique” firm-within-a-firm, our close working relationships with lawyers in other practice groups inform and cross-fertilize a business-oriented view of intellectual property matters. This business orientation results in efficient and informed involvement by intellectual property counsel, not only in formulating and implementing strategic portfolio management, but also in counseling on acquisitions or divestitures, joint ventures, strategic partnerships, licensing arrangements, and even general contracting matters. The strength and experience of our litigation practice also informs our overall approach to intellectual property law. While litigation is rarely desirable to our clients, the intellectual property dispute resolution experience of our lawyers is invaluable in a client counseling role. It allows us to anticipate potential portfolio development and management problems that other lawyers might not foresee and allows us to help our clients either avoid disputes or optimize their position when litigation becomes necessary or unavoidable. It also allows us, when preparing and prosecuting patent applications, to obtain broad protection and to ensure the validity and enforceability of patent claims. Not only has Calfee been an “entrepreneur’s law firm” throughout our history, the Intellectual Property group is, in itself, a success story of legal entrepreneurship. Our entrepreneurial heritage also has taught us to live by a proactive service model that is beneficial to all of our clients, from closely held companies to public entities. We strive to update our clients consistently and promptly on pertinent developments and risks associated with their businesses. We are dedicated to swift and responsive communication with our clients, and we believe this results in more efficient performance of legal work, strong relationships with clients, and high levels of client satisfaction. Most of the lawyers in our practice have undergraduate and/or graduate degrees in mechanical, aerospace, electrical, computer, biomedical, or chemical engineering; or in chemistry, bio-chemistry or the biological sciences. Our attorneys offer a unique combination of technical capabilities and strong communication skills with pragmatic business counseling. Many of our attorneys have decades of experience practicing IP law. Our Intellectual Property practice develops and protects the intellectual property and technology assets of a broad spectrum of clients. Our IP attorneys conduct patent and trademark searches; prepare and prosecute U.S. and international patent, trademark and copyright applications; and they work with clients to maintain and enforce issued patents and registered trademarks. We provide corporate counseling on issues of licensing agreements; assignments, security interest and confidentiality and nondisclosure agreements; trade secret protection; and patent and trademark infringement. Calfee attorneys also represent clients involved in intellectual property disputes and litigation – helping resolve or litigate issues of infringement, trademark oppositions and cancellations, Inter Partes Reviews (IPRs) of patents, and trade secret and unfair competition violations. Serving a national and international client base comprised of both established and entrepreneurial enterprises, Calfee provides fully integrated, high-quality legal services throughout the United States and around the world. Our attorneys work with clients to develop strategies for utilizing the client’s intellectual property, protecting trade secrets, and for dealing with adverse claims of patent, trademark and copyright infringement. Calfee's IP Qualifications at a Glance provide additional details on our team of highly skilled attorneys.